Every time Apple releases a new iPhone or iPad along with it comes an update to our beloved iOS. And after updating to the latest version of iOS on our iPhone or iPad sometimes you find the device has slowed to a crawl. If you don’t want to take my word for it, between early August and November 2017 which is just after the launch of the iPhone X, iPhone 8, and iOS 11 the number of Google searches for “Slow iPhone” rose over 50 percent. For the tin hat brigade or those a little more skeptical there is a clear correlation between the new iPhone coming out and your existing device slowing down. Leading to the obvious conclusion that it is being done on purpose to force you to upgrade sooner rather than later, a term often referred to as “Planned Obsolescence”. However convincing this is actually an urban legend when it comes to your iOS device until it reaches EOL (end of life where Apple will no longer support or update it), the reason your iOS device is slowing down is less area 51 and more to do with the way software is developed and deployed; your update to iOS 11 for example. Again you don’t have to take my word for it, the people over at Futuremark have tested this theory and conclude the devices performance is indeed steady over time. What’s really happening is: When Apple introduces new iDevices (hardware), a new update to iOS (software) follow or in the case of iOS 11 precedes the hardware release and this software is optimized for the newer hardware and also contains bugs and certain nuances which have not yet been ironed out a noticeable one being the predictive text bug. Read more here. Moving your files and settings into the new operating system from the old is actually a very technical process often referred to as migration, if you are a Mac aficionado you may have some experience of this with the Migration assistant. And so when you update your iPhone to the latest version of iOS (“the software”, specifically the operating system) problems may occur where the files are not optimally stored or caches are out of date or even corrupted. Which in turn can make simple operations like opening a web browser seem sluggish in comparison to the previous version of iOS. Just the same as updating Mac OS if you are a Mac person or similarly Windows a fresh install of the operating system is a far better approach than simply updating. When the update process was tested by a software engineer at Apple it’s likely they used a fresh device and not the same number of Apps, and data you have on your iPhone or iPad. So play the game make a fresh install and a complete back up of your iPhone , perform a factory reset and update the device to the latest iOS before bringing back your Apps, Photos, email and more. Plug your iPhone / iPad into a computer and do a Full Back Up via iTunes. Settings > General > Reset. All your data will be erased from the device at this point so make sure you have followed the steps here to back up your device. Now update your iPhone or iPad to the latest version of iOS (at the time of writing that is iOS 11). 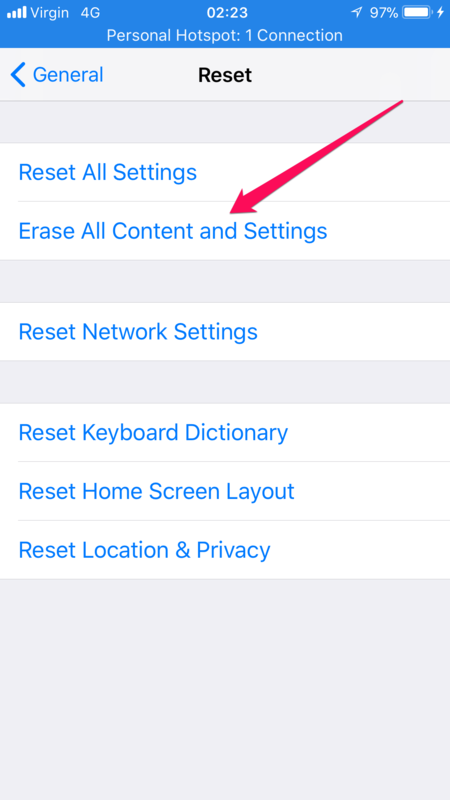 After the iPhone or iPad has been erased you will need to restore it, simply go back into iTunes and go to Summary > Restore iPhone ; using the latest back up you made before you started this process. 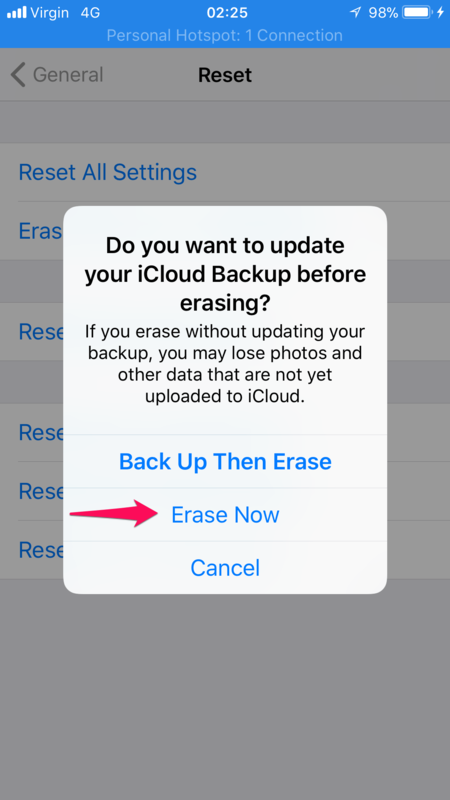 If you have chosen to use iCloud backups instead although to my mind if you are having a problem with iCloud this is not the greatest idea simply follow the Guide on Apple support but choose the iCloud back up option instead. It’s possible your iPhone or iPad seem slow due to reasons not associated with the device itself. Your iOS device and many Apps on it are reliant on an Internet connection and any gaps in performance here can start to make the device seem slow. Upgrade your WIFI router, the latest specification is 802.11ac which provides very fast WIFI connections up to 1.3Gbps, newer network routers also offer what is called mesh networking which allows you to use multiple routers to provide a strong WIFI signal throughout your home and office. This is also referred to as Bridged networking from router to router; some newer products such as Google WiFi do this automatically as does the excellent Airport Extreme just use the Apple’s setup “wizard”. 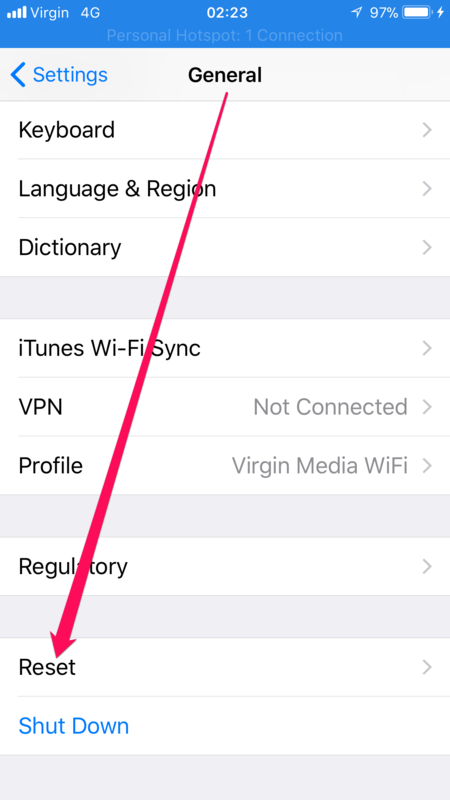 For iPhone’s and iPad’s as a rule of thumb leave 2Gb of free space available to the device so if you’ve got a 64Gb model only use up a maximum of 58GB yes 58GB you’ll notice that the actual total capacity of a 64Gb model is less than 64GB! 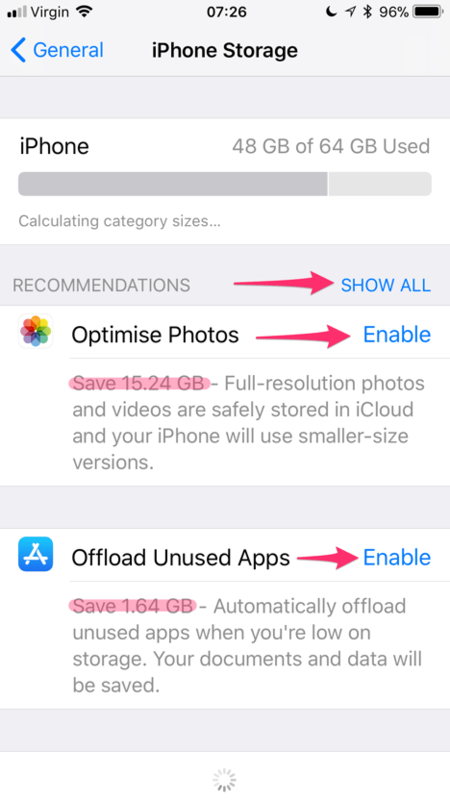 Helpfully on the same settings page Apple has grouped some quick ways of freeing up space on your iPhone or iPad. 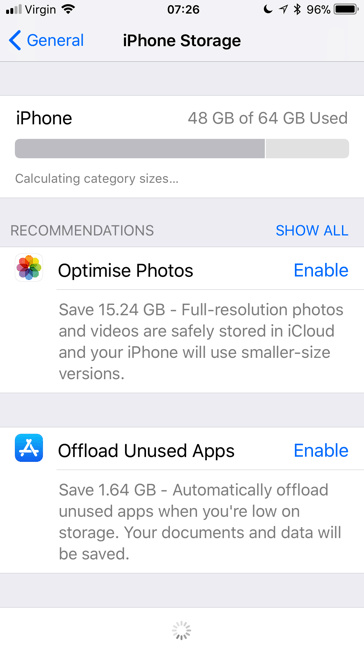 Under recommendations use the “Optimize photos” option and “Offload Unused Apps”, you can also tap “show all” to see further optimizations for the iDevice’s storage space. These are best done when connected to WIFI. Do follow the steps set out above to get your beloved device back up to speed, however after all is said and done some of the new Apps and the latest iOS will have been updated to use newer more powerful features that are only supported on the newer iDevices. Plus if you are still on an iPhone 6 or 5s there are some really cool new features on the latest models of iPhone such as Wireless charging, A more powerful camera, and the A11 Bionic chip powering it all.